Little Tokyo’s Seryna: Best. Chirasizushi. Ever. One of my favorite Japanese dishes is Chirashizushi. Roughly translated to scattered sushi, it’s basically a bowl of sushi rice that’s topped with an assortment of sashimi. As with a lot of my favorites, it’s my goal to find the restaurant that makes it best and so far, the one I wax poetic the most about is the Kaisen Gozen from Seryna. A quaint little restaurant nestled in the Little Tokyo compound in Makati, Seryna is frequented by a lot of Japanese expats—a sure sign that you’re getting a good thing. They’re open for lunch and dinner, but are closed in between. I haven’t been there for dinner but I’ve been over for a couple of lunches. Like most Japanese restaurants in the area, they offer affordably-priced lunch sets that have a salad, miso soup, a pickle dish, the main dish, and some fruit. While I’d like to talk about their other dishes, unfortunately, the only thing I’ve ever ordered there is the Kaisen Gozen lunch set (Php 320), their chirashizushi dish. I love it thaaaat much. Roughly translating to a freshly prepared dish made especially for you (thanks YUE! 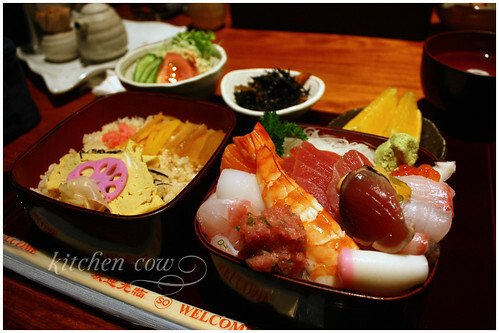 ), Seryna’s kaisen gozen is a delightful melange of fresh seafood on flavorfully seasoned sushi rice. Unlike other chirashizushi that are served donburi-style (rice in a bowl with toppings), Seryna’s chirashi is made of two layers. The bottom layer has the sushi rice, topped with a variety of seasoned vegetables, like takuan (pickled daikon) and renkon (lotus root). The other layer is filled with whatever makes heaven up. Resting on a bed of shredded daikon is an assortment of fresh cuts of fish, the type of which, depends on what’s available that day. Tuna, salmon, ikura, ebi, ika — it all depends on your luck. The day this photo was taken, I even got some seared tuna. Nicely browned on the outside; sweet and fresh on the inside. And the uni! Each time I’ve eaten here, the uni is brimming with freshness. It’s mouthwateringly sweet, melting in your mouth with a fresh flavor. There’s nothing fishy-tasting about it. Just pure velvety uni. 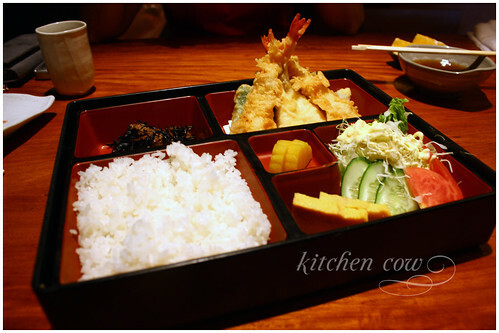 Aside from the kaisen gozen, there are other available set lunches, like this Tempura Bento. It was a good tempura dish, according to mom and I’ll take her word on it. I hope you’ll forgive me if I’m not much help regarding the other stuff—but can you blame me for falling in love with the chirashizushi? This entry was posted in restos & eateries and tagged chirashi, chirashizushi, japan, japanese, little tokyo, makati, manila, philippines, restaurant, seafood, seryna, sushi, tempura, zushi. Bookmark the permalink. 20 Responses to Little Tokyo’s Seryna: Best. Chirasizushi. Ever. that looks good. i haven’t eaten in little tokyo. and when i do, seryna will be my first stop. and i’ll order that. :o) yum! I can’t blame you Kao, Kaisen Gozen is the only thing I order there too. Haha! It’s just walking distance from my place. I blogged about it last May as one of my “future foodie destinations” since I moved to Makati. I was undecided if I’ll get the kaisen gozen or makunouchi bento, now i know I should get the first one 😛 Thanks! hmmm, must try this chirashizushi dish, looks delicious!! those photos look good enough to eat! what a nice looking tempura you know, I’ve always wondered about the shredded cabbage that’s with the tempura bentou. is the dressing simply Japanese mayo or is it a special kind of dressing? Hahahaha, it’s good that you agree with me! Sarap no? You have to! It’s insanely good. Best evar. Ah yes. They only prepare a certain number. I’m not sure you can pre-order but it’s worth a shot? Might as well make reservations too because it can get packed at lunchtime. And yes, they have larger dishes that you can share but that would be on their regular menu. Just ask for their ala cart menu if you go there for lunch because they usually hand out the lunch set menu only. Most of the time, and this one as well, it’s just Japanese mayo but I wouldn’t be surprised if use different dressings. after this post, i found a friend willing to join me and last saturday we went. we enjoyed the food. we ordered the same dish you and your mom ordered. hehe! the lunch sets are P350.00 now, though. Oh, I didn’t realize they raised prices. Still worth it though? Happy you agree with me. After living many years in Japan, I can assure that Seryna is barely average for Manila. 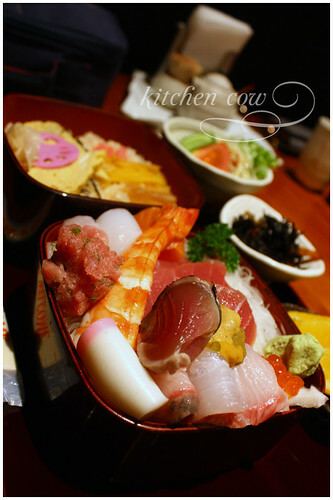 It’s more middle of the road fare as opposed to true connoisseur’s sushi… or chirashi. I was severely disappointed given the other comments here. Hi Jim! I’ve always been satisfied with Seryna’s sashimi, especially considering their relative affordability. I haven’t been to Japan, but my Japanese expat friends assure me that Seryna’s is good. Either the (1) quality has changed since I’ve been there, (2) you happened upon them on a bad day, or the most likely (3) we have different standards. In any case, if Seryna’s barely average, may I know what local restaurants you recommend instead? I’d love to try them out. i recently decided to try Seryna because of this post, and found out too late that their dinner menu charges twice than their lunch menu. It was still a good meal but i’ll definitely try going there during lunch hours next time! I heard they’re pricey for dinner. I haven’t tried since we usually went there during our lunch break. I hope you manage to drop by that time too, though their lunch sets are different from their ala carte menu.